DEBORAH CROMBIE: Yay, it's THE WEEKEND! But wait--this is how I'm spending my weekend. I'm doing my copy edit. And I think I have worked every weekend since, oh, September? And darn it, I like weekends. I know I'm self-employed, and we have this years' long argument in our house, where the hubby says since I can set my own hours, weekends shouldn't matter. I should do my errands when other people don't do them, like on a Tuesday. But I like to look forward to having a couple of days off in a regular schedule, and I like taking my days off when other people are free, too, like my kiddos and my friends. So give me Saturday and Sunday, please! I think that some of us prefer to write seven days a week, but for me that's a necessity, not a choice! I like to have a couple of brain-rest days, get all my chores and errands done, and chill out a little bit. Then I feel ready to dig in on Monday morning. REDS and writer friends, do you write seven days a week? Or do you take weekends off? RHYS BOWEN: If nothing is scheduled I work all weekend until I have a first draft finished. I don't like to take a break when I have a story in my head. But I do like the idea of lazy weekend days, picnics, walks beside the ocean. I used to love breakfast at college. We'd collect food and coffee from the dining hall, buy the Sunday papers and take them to someone's dorm room. Now there is always something to do! DEBS: Rhys, I want your college weekend NOW. HALLIE EPHRON: It's dark and dank here in New England so no playing outdoors for me, either this weekend. I'm between books but I have some writing workshops coming up so I need to put materials together for them. And as far advance in as it is, I'm working on getting ready for my 8/6 book launch. There's a ton to get done. If there's a break in the rain, I'd like to get over to the beach and take a walk in the only-sightly freezing weather. 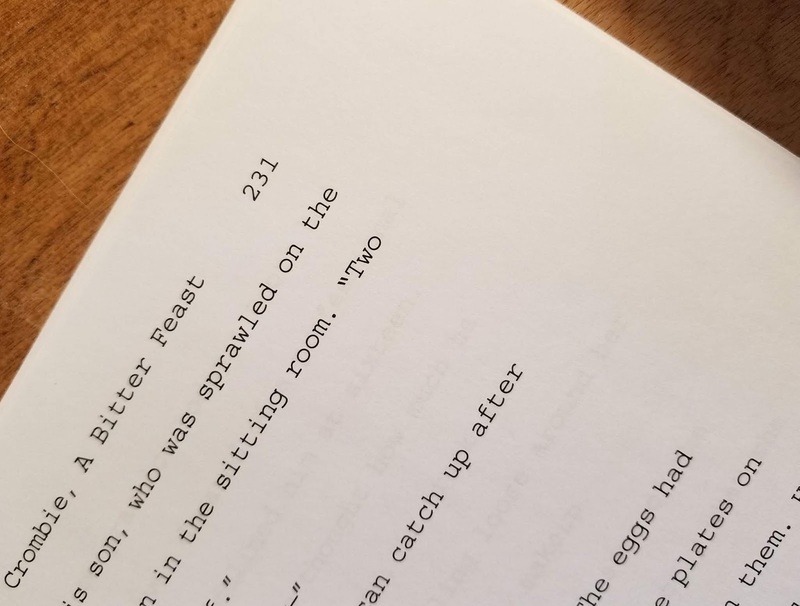 JULIA SPENCER-FLEMING: I'm also editing this weekend, Debs! Not at the copy edit yet - this is the Big Editorial Letter edits, following the really Big Scene Edits and undoubtedly preceding the Fiddly Little Bits Edit. I'm not a seven day a week worker - if I were, it wouldn't take me so long to finish a book! But I know myself, and I need at least a day off each week. Those of you who comment here will notice I'm not on social media Sundays (except to post the Maine Millennial's column on my Facebook page.) I believe it's especially important to take time away from the internet once in a while - I try to stay completely off the computer on Sunday. This weekend, I'll be having dinner at frequent Reds commentor Brenda Buchanan's house, and will also be seeing CAPTAIN MARVEL with my daughters. We spend so much time working, being on, being available - it's good to spend some time in the real world, with people who love you. Readers, are your weekends reserved for relaxing? Tell us what you're up to! There’s no particular “must do” pattern for weekends around here, just tackling whatever needs to be done. It’s not quite warm enough here to do outside/gardening work, so after the usual household chores are finished I’m probably going to spend most of my time reading . . . . I definitely try to relax some, although I am reading and polishing reviews on the weekend. It's not my day job, but it is still work since I do it for my blog. This weekend is the start of ultimate Frisbee beach league, but odds are I will miss at least part of the day since I just tried to install a thermostat by myself and messed something up, so the guys who just installed my new heater/ac will be back out tomorrow (with a new visit fee, of course) to figure out what is going wrong. I should have just had them buy it and install it for me when they were here on Tuesday. Instead, I gambled that I could figure it out myself and lost. I found a cheaper place to buy it and it is going to cost me instead. I knew it, too. I can never do any project around the house without it turning into a disaster. Sorry, I'm tired, and I'm upset for I'm rambling. I really wanted to go to the beach tomorrow! Anyway, my parents will be back through town with my niece and nephew, so I will get to see them for a little while as well. Mark, I know exactly how you feel! Washer went on the blink, I thought it would be cheaper to fix it myself--spent a week or so just trying to find the correct part number and whether I could find it locally--finally gave up, called the repairperson--within a half hour, problem diagnosed, correct part installed, washer up and running. Sigh. Enjoy visiting with your family! Mark, that's so annoying and frustrating. If it's any help, my husband is a pretty good fixer/installer, but even he has had the occasional fail. Enjoy your weekend anyway. Waiting for service people is always a chance to read a good book! Debs, I'll be part of March Madness tomorrow, as my Kentucky Wildcats play tomorrow afternoon. Hubby and are going over to his mother's to watch the game with her. We are all big fans, and it is hubby's and my alma mater. Sunday will hopefully be a reading day for me. Basketball goes back a long way in my family, Debs. My mother played on her high school team, in the 1920s! Then, brother played and I was a cheerleader, so we went to all the games at our high school, along with our parents attending. Fandom for the men's basketball team at University of Kentucky seemed to always be a part of our household, even before both my brother and I went to school there. I met my husband at UK, so we continued the fandom when we got married into our household, but for some reason, our kids didn't catch it. My daughter, who is married with her own family now, is somewhat interested when I talk about it, but she married someone from Indiana and lives there now. I blame her husband for her lack of participation. Hahaha! My son actually lives in Lexington and attended UK for two years before transferring to another university to finish his degree, but he doesn't seem to have much interest in the games either. Thank goodness they both enjoy reading, or I'd feel like a complete failure as a mother. When I freelanced out of my home, I always set aside the weekend. I even kept regular work hours during the week, since I had to coordinate with the folks in the main office. It was the only way I could train my brain to stop working once in a while, since the work was right there at home, waiting in the next room. Nowadays, of course, I have a "regular" 10-6/M-F job, so what am I doing this weekend? Giving up Sunday, Monday night, and Tuesday night to our March concert! No weekend for me as I try to cram all my chores into Saturday, then spend all afternoon and evening on Sunday in rehearsal. Back to the office Monday, then a Monday night rehearsal until 9:30, and Tuesday is the concert. I may be home by 11:30 pm. Usually I get the Friday after a concert off, to steal back my Sunday, but this week I have a big Friday grant deadline, and next week I have a Friday/Saturday band festival. Weekend? What's a weekend? Ouch, Gigi. Rehearsal weekends are always hard. I say I don't like to work on weekends, but one of my very favorite things is our Saturday or Sunday afternoons when we get to brainstorm our books over a pot of tea or a glass of wine. That doesn't count as work! Definitely not. That counts as fun, even when you shoot down all my absurd whimseys. I always work on Saturdays - except for today, when I'll have a full day at Murder and Mayhem Chicago! But I try to take a day of rest on Sundays. I worship at Quaker Meeting, and working on a book in the morning before sitting in expectant silent waiting for an hour doesn't work too well - my mind is on my book instead of taking a break from it! I like Julia taking a day of Internet rest, too. That one is harder for me. Like you and Julia, I usually stay off the Internet on Sunday, except for the blog. It's not a hard and fast rule, I just usually give myself permission not to check in. It feels very restful and liberating. I want you to know that I READ seven days a week and never take a day off! Being retired and living alone I can do pretty much whatever I want, whenever I want. So I do! Since I retired at the end of 2018, I mostly do the same Judi : read and do what I want when I want. It is largely satisfactory when you have worked so hard all your life but people around me don't seem to understand this, how about you ? Sounds great to me! However, retirement is not something I ever contemplate, so just one day to read all day is a real treat for me. In the past, my work has always been to deadlines--so that often meant weekends, too. Now I have a part-time job at a local history museum--which is only open on weekend afternoons right now. How fair is that? ;-) But it's only the afternoon and I'm stationed in the building with all the archaeology exhibits--so I can share as much (or as little) as visitors want to hear of my love for the prehistory of the area. (And my evenings are still free to read, quilt, visit). Enjoy the movie, Julia! I hope you and your girls love it as much as I do. I was able to work from my home until this January when I became a 8-5, M-F Office worker again. I'm sorry to say that my house is a mess, I'm behind in the laundry, and my car is in desperate need of a wash! I just can't seem to adjust to cramming a week's worth of maintenance into the weekend. Daylight savings has helped. I have more energy at the end of the day but I seem to channel that into writing. Open to any and all suggestions, dear Reds and Readers. How do you get it all done? If I got it all done, Lyda, I would tell you! I try to clean out the fridge, do meal planning and shopping on Saturday, plus errands, then stay home on Sunday and get the laundry all done. Somehow it never seems to happen quite like that. This week, I think the same laundry has been sitting in the dryer since...Tuesday? When Julie retired the first of December, we both thought how wonderful it would be to get the errands done during the weekend and have Saturday and Sunday free. Not. It's taken until last week for us to get that part right. First the groceries: Julie has always gone on Saturday, and it was difficult to either inch up a couple of days or wait a couple of days. But this week she got it all done on Thursday. Ah retirement, so much fun and so confounding to someone whose prior life was planned to the last minute of the last hour, and that always got screwed up anyway. Chores on Saturday and a day off from writing. Now that the snow has melted, I'll pick up all the sticks and branches that came down in high winds over the winter. And have a Wordsworthian moment admiring the daffodils. I grab two hours on Sunday afternoons to plan a week of writing and make an in box of everything I need. Ah, Margaret, you inspire me. That Sunday afternoon writing planning is what I always INTEND to do. I too work 8 to 5, 5 days a week. Actually I work 8 till whenever the jobs is done, usually 5:30 or 6 but that's my problem. Aside from my once my month Altar Guild/church prep and flower arranging, most weekends are for cleaning my home. It's a little apartment, it should be easy, it's not. Last weekend I finally broke down the boxes that have been accumulating since before Christmas. This weekend I attacked the pile of junk mail that needs to be sorted, shredded anything that might have important numbers on it and walk everything to the dumpster. I take one "small" pile at a time, accomplish it and then I sit down - read and crochet. Now don't take offense to this but reading and crocheting turns off my brain so that I'm not constantly thinking about work. Oh and I have to get to the laundry room to do at least one load of laundry so I can return to work. To be honest, as I sit there readng and crocheting, I survey my surroundings and I think I should be doing more but then I don't. I so admire anyone who can maintain a real schedule, while working from home. When the kids were still living at home I did a better job of remembering what day it is, but living with a man who never, ever took days off--including weekends and holidays--means that one day blends into the next unless I really pay attention. It's not easy to stick to any kind of routine, although I think we're starting to do better. This weekend the library is giving away trees, so I'll be dropping by to pick one up for the new house. Steve just left to get one, too. They are great trees for this area, bald cypress, and will make a nice addition to the trees we've been carefully nurturing to replant in the next few weeks. So one of my (millions of) jobs this weekend is to figure out where the bald cypress, rescued magnolias, and oak trees will go in the new landscape. Finally getting to use my Master Gardener chops here! I'm also planning to put some of our large pots to work, filling them with spring plants that I can place around the house for the real estate photos, and then move to the new place, already planted. Otherwise, I'm like Judi: I read seven days a week, too. Shocking, isn't it? Karen, I want free trees from my library, darn it! Although I suppose with all the maple saplings I have to dig up every year, I should be the one giving them away. Karen, so impressed that you are a Master Gardener. I hope one of these days you'll share your new landscape with us. The trees turned out to be tiny sticks! It's going to take awhile for these babies to do much. I just hope the deer leave them alone. This weekend is unusually lightly scheduled. Bob and I are attending a memorial service for a friend this evening. It is being held two hours away from us which might sound like a negative, but we've had a crazy busy week so I actually look forward to the four hours in the car as quality catch-up time for us. If I were self-employed and fully in control of my hours, I'd still want my weekends mostly free, because that's when most other people are available, but like Deb's husband, I'd also want to take advantage of doing chores when the lines are short. So I'd probably pick one weekday to curtail to a half-day of work, and plan one short block of working time on the weekend as an offset. I'd like to say that I'm totally relaxing on the weekends but that would be a lie. Saturdays usually start out with housework: Emptying trash, vacuuming, laundry. Once the housework is done, then I usually head off to pay some bills in person (when I can) and run whatever errands I might need/want to do. Today, I'll be paying a bill (once the laundry is done drying) and heading over to my local comic shop to pick up my weekly batch of new material. I'll pick up a pizza on the way over and share it with the guy at the store and whomever might be there doing their gaming events. After that, I'll head home and start laying out the new CD review I've got to write and the new Cassette Chronicles article as well. Just the layout, I still have to finish listening to the material so I'll do that and then write the stuff tomorrow. As for March Madness, unless you truly follow college hoops it is easy to get confused. Yes it is a big event as millions of dollars are waged on the tournament. A friend of mine always takes the first Thursday and Friday of the tournament off from work so he can watch all the games. But, it's not just the men's tournament going on. There's also the women's tournament. And that just covers the Division 1 schools. There's the D2 and D3 tournmanents. There's the NIT and the WNIT. There's also the CBI and CIT tournaments as well. And I know all this because I used to be an insaniac about the tournament. I watched so much hoop action it was ridiculous. I filled out brackets for the men's and women's D1 tourneys and the NIT and WNIT tournament. And every morning, I'd check for the results of the other tournaments I mentioned above too. I say used to because this is the 2nd year where I've not bothered to fill out a bracket. Since my time coaching came to an end nearly 7 years ago, my fandom for sports has retreated a bit. I mean, I still watch and read about my teams, but I'm not the crazy nutjob I used to be. As for my plans for tomorrow, I'm probably not going to be doing much other than writing those articles. After I do that, I've recently started reading a sci-fi novel that I bought at a comic convention last year. So I'll probably read more of that. Jay, I'm tired just thinking about your weekend! Jay, thanks for the little March Madness lesson! No one in my family ever played or watched basketball, and my college was focused on academics rather than sports, so basketball in general is Greek to me. Julia, I'm tired all the time so welcome to the club. Deborah, I grew up a sports nut. I started coaching when I was 14 and did it for 25 years. It was just a part of who I was. It's sunny but cold here in Pittsburgh, so no outdoors time for me. Unless I end up being the one who takes Koda for a walk later, because the dog needs a walk. Spending today working on the last polish post-developmental edit for HEAVEN HAS NO RAGE before it goes to the line editor. Like Julia, I usually take Sundays off. That's when we see movies or I loaf around. Julia, enjoy "Captain Marvel." I did. The Smithie and I have been waiting for Youngest to be home (Spring Break) so we can all see it together. I'm looking forward to it! I'm taking a three hour water-wise gardening class this morning. Hopefully I will get some ideas on what to put in our front yard instead of grass. I usually work Saturday mornings on ideas for my school library. There is no way to plan lessons, etc., without interruption when you work with 1900 middle schoolers! More proof, if any were needed, that educators work far more hours than the school is open, Mary. I remember my mother, and English teacher, grading in the evening, writing up lesson plans on the weekend, etc. I'm not really complaining about having to copy edit--I actually like the process. My copy editor is wonderful and it's always fun to see her little tweaks. And the dumb things I missed... But I had hoped to be finished with it by this weekend, however, I have been working in fits and starts. The fan is going out in my computer and I have to quit whenever it starts to over heat or everything crashes. Ah, technology. But I wouldn't go back to a typewriter. And my new laptop arrives on Monday!!! We are supposed to go mattress shopping today! Exciting, right? In general...there is no weekend "in general" to describe. Often, there are family events because that is when kids and grandkids are free; when husband, not retired, has time; or socializing with friends who are not nearby (brunch in the burbs tomorrow). But sometimes the weeks go upside down and weekdays are filled up with time-eating dr appts or out-of-town visitors or house repairs, and writing must get done on a weekend. Some will get done today no matter what. I have no routine since I've been "retired." I do try to do any shopping during the week since it's much less hassle. It is cloudy here but warm; we should have a nice week ahead. We picked up our granddaughter from the airport last night. She's visiting on her springbreak per usual. She said it was snowing (NE Ohio) when she left. We'll see what she wants to do. Sunday, one of the major streets in our neighborhood will shut to vehicles for four hours to encourage people to walk, bike, skate, whatever. The merchants will have their stores open and there will probably be bands here and there. We may go check it out. The art museum has the Van Gogh exhibit going right now and I do want to see that. I'll have to see if that interests Granddaughter or save it for Son and me to do. We are scheduled for a campus tour of a culinary institute next week. GD is super excited about that; her mom is flying in to check it out too. I think she's chosen cooking over music (plays the cello) so I hope it all works out for her. I agree if you are "retired" or "stay at home worker" like I am you should shop during the week, especially if it involves going to a big-box store. I try to stay on course with the rest of the world, but holidays and weekends are just like most days, except Sunday we go to church. Today I am making a trip to the credit union, going to sign a petition, and spend the rest of the day watching movies - I'm in the middle of The Favourite right now...next up is the new Mary Queen of Scots. Mom will be watching Instant Family and a Hallmark movie about a dog at Christmas. It's an overcast day here in our part of Colorado so perfect movie watching weather! Shalom Reds and fans. Even being retired, my weekdays are filled with places to be and stuff to do. I keep track of where I have to be with Google calendar and a regular planner. The regular planner is new this year but frankly, I don’t know what I did without one. My weekend starts on Friday evening. Among some friends and acquaintances, we have a ritual of sharing a trip to a local pizza place. Usually, ten to fifteen people show up and they now reserve a table for us. They made a big fuss over me on my 64th birthday. Saturday is usually a down day for me. I can sleep in. Today I will watch a little college basketball on one of my tablets. I do have a load of laundry in the machine. I have a roommate and twice a month we go to a local Christian coffee house which has live music. Tonight, I have purchased online access to a video feed of the American Israel Public Affairs Committee Conference that will run through Monday. Sunday is church. Some close friends pick me up every Sunday morning and we get home just after 11 am. I do need to do some food shopping after that. It’s still too cold to linger outside but when Spring truly warms us a bit, I look forward to taking my collapsible lawn chair and sitting reading a book, drinking some coffee or just enjoying the sun. Seven days a week writer, here. But I do a lot of entertaining stuff during the week - lunch with friends, working out at the gym, movies with the hooligans, date night with the Hub -- so I don't mind working every day. I find it helps me stay connected to the story. If I took off two days I might lose my momentum. Good luck on your edits! Tomorrow I am going to Leipzig for a visit of Germany's second big book Convent, besides Frankfurt which is more international. It will be kind of "bathing" in book for the whole day. I hope to meet a few authors especially from those who write really interesting books in the context of gay romance, some as a mixture between thriller and romance and quite some about the victims of hate crime for instance, how they try to live with what happened. I sometimes miss the view of the victims in nowadays novels .. Enjoy Leipzig! That sounds wonderful! Since I'm retired, I do most of my errands and lunches with friends on weekdays. Some Saturdays I go to the library as I did today, and Sunday is church. Today was too windy but I may do some garden clean-up tomorrow afternoon. Glad to hear that I'm not the only one who can't Do It Yourself. Now that I can't see that well, things are even worse since most things are stuck in dark corners. Me, too, Sally. I can't go to bed without a book.